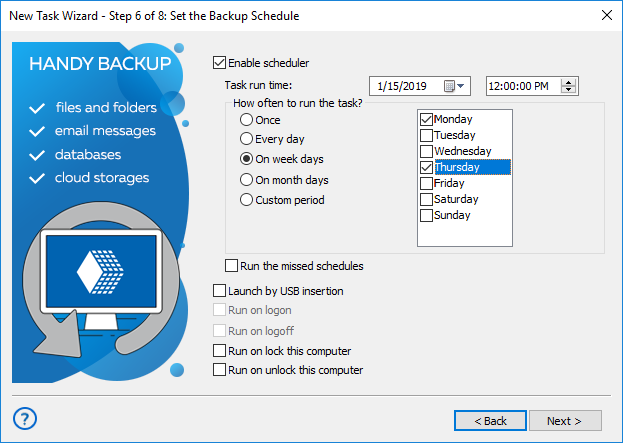 You can manage Handy Backup to run any backup task when log off the computer. This way, the system will perform the selected task before shutting down or exiting from the system, saving all results selected for backup before finishing the session. Routine workflow backup on logoff, to execute reserve copying outside the worktime. To set up a Handy Backup task to run on logoff, please see the following instruction. Create a new task by selecting an appropriate control item, or by pressing Ctrl+N. Alternatively, open an existing backup task to edit the properties. On a bottom of this screen, find an option called “Run on logoff (the task will be executed upon logging off). Mark the checkbox against it. Finish the task creation, or accept all changes and close the property-editing window. Your selected task will now run every time before shutdown or logoff, until you delete the task, quit Handy Backup or remove the logoff scheduling property from this task by unchecking it.